My name is Blair Saunders. Originally from Canada, I’ve been living in Delaware for the last 20 years working in I.T. in the financial management industry. Besides hockey, my real background is in cycling. 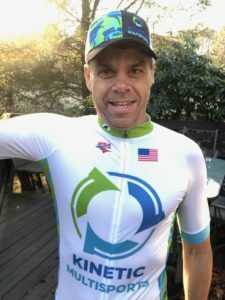 Winner of an Olympic trials in 1992 I represented Canada in 13 international events as a member of the Canadian National Road, Team Time Trial, and Track teams, and represented the USA for the first time in 2017 winning an Aquabike AG World Championship. Always looking for a challenge I moved from road to track to mountain bike stage racing to cyclocross before getting the multisport bug. Competing together as a family as my swimmer kids grew up it became more of a family affair. While I have completed 3 Ironmans along the way while my wife, a former pro triathlete in her own right, has done 26! We’ve brought a lot of young swimmers through the sport of triathlon and I hope to give back where I can through the #kineticmultisports Ambassador program.